It’s slowly warming up here and we are tentatively venturing further out of the city. The sunshine, blue skies and spring temperatures are a lure we don’t want to resist. 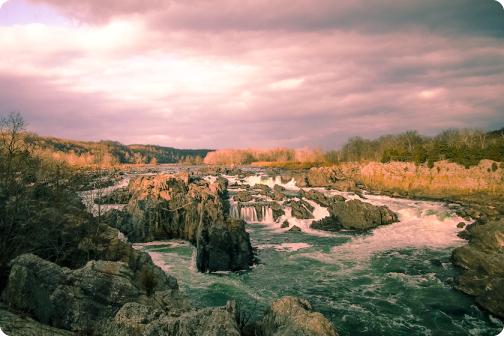 Two weekends ago we rambled around Great Falls National Park on a trail that skirted the wild roiling Potomac, we clambered over the craggy rocky bank and ventured into the forest along the Virginia side of the well known river. There were spring flowers blooming and the dog, my boys, my man and I bloomed right alongside. We got swept up in the outdoors and our imaginations went wild. My husband decided day trip hiking was small potatoes for us. Backcountry camping is what is in store for this family. This weekend while waiting for the supplies necessary for this new enterprise to arrive in the mail, we checked out Mount Vernon. The first president of this country certainly knew how to make the most of his well situated land. His love of nature was apparent with all the attention given to the grounds surrounding his home. This jaunt, while fun, made us all the more keen to get away. Shenandoah is on the agenda. This weekend we are off. Backpacks loaded with all we need for a 2 day hike into the woods. It’s been nice knowing y’all, I’m sure the bears will get us this time.